Sugar-Free and Flourless Chocolate and Oatmeal Cluster Cookies are easy and delicious, and these can be made with the sweetener of your choice! And if you use gluten-free oats, these cookies are gluten-free. Use Dessert Recipes to see more sugar-free or low-sugar desserts. 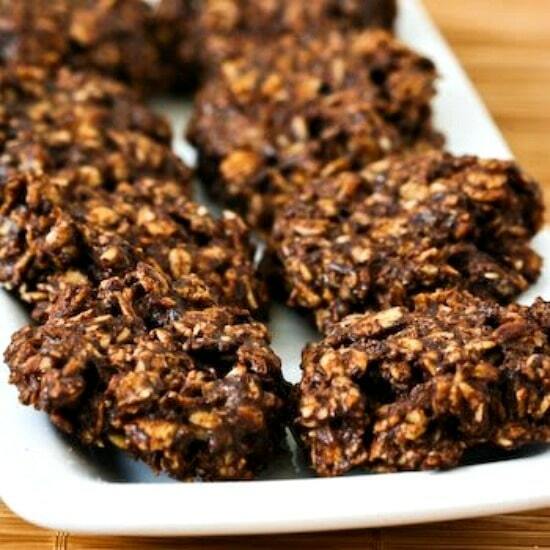 Click to PIN Sugar-Free and Flourless Chocolate and Oatmeal Cluster Cookies! Years ago I spotted Choco Cinnamon Oatmeal Cookies on Mochocholata-Rita which reminded me of something my mother used to make, and I thought it would be fun to come up with a sugar-free version. After a few attempts I had two similar but slightly different versions of the cookies. I’m sharing an updated recipe here for the fudgy version of Sugar-Free and Flourless Chocolate and Oatmeal Cluster Cookies, and if you prefer a more cakey cookie (that’s a bit sweeter and also not completely sugar free) I’ll give you the printer-friendly link for that version below as well. Photos here are the fudgy version of the cookies, but both versions look similar. These cookies do have oatmeal, so they’re not super low in carbs, but they are tasty for a sugar-free holiday treat. If you’re not watching your sugar intake, these cookies could be made with sugar and the cookies would be gluten-free if you used gluten-free oatmeal. First combine rolled oats, Stevia-in-the-Raw Granulated Sweetener, Monkfruit Sweetener (I prefer Lakanto Golden Monkfruit Sweetener for cookies), cocoa powder, and pinch of salt in a medium-sized bowl. In a separate bowl combine olive oil, vanilla, and egg. Combine wet and dry ingredients with a fork, stirring until all the cocoa powder has blended with the oil and egg, then chill cookies several hours. To bake, preheat the oven to 350F/180C. Line a baking sheet with parchment paper and make small balls of batter (probably about 2 teaspoons.) I smashed the cookies down with a fork a little before I baked them, which is probably necessary because they don’t spread out very much. Bake 12 minutes, or until cookies are firm but not hard. They will harden a bit more when they cool. Sugar-Free and Flourless Chocolate and Oatmeal Cluster Cookies are a tasty sugar-free cookie to bake any time you need a chocolate treat. In separate bowl, whisk together vanilla, olive oil, and egg white. Pour wet ingredients into dry ingredients and mix together with a fork until the cocoa powder is dissolved and ingredients are well combined. Chill cookie batter several hours. To bake, preheat oven to 350F/180C. Line baking sheet with parchment paper. Put small balls of batter (about 2 tsp.) on the parchment paper, spaced apart slightly. Press down with fork to make cookies about 1/2 inch thick. Bake 12 minutes, or until cookies are firm but not hard. They will harden a bit more when they cool. If you prefer the more cakey and higher sugar version of these cookies, you can see that recipe here. This recipe inspired by Choco Cinnamon Oatmeal Cookies at Mochachocolata-Rita. Two things that caught my eye about these cookies back when I was a South Beach Diet fan were the use of olive oil, and the fact that the cookies didn’t have flour. Both those things make this a great cookie choice for the South Beach Diet, but these cookies are phase two or three for South Beach, due to the oatmeal. The cakey version that uses agave is probably phase three. Cookies with oatmeal are too high in carbs for a low-carb diet plan. If you want nutritional information for a recipe, I recommend entering the recipe into this nutritional analyzer, which will calculate it for you. Or you can sign up for a free membership with Yummly and use the Yum button on my site to save the recipe and see the nutritional information.